Upstairs at the Bartlett Homestead, the rooms represented a variety of talent. Mark and Susan Bijleveld of Finished in Fabric specialize in antique upholstery and reproduction, using old world techniques. 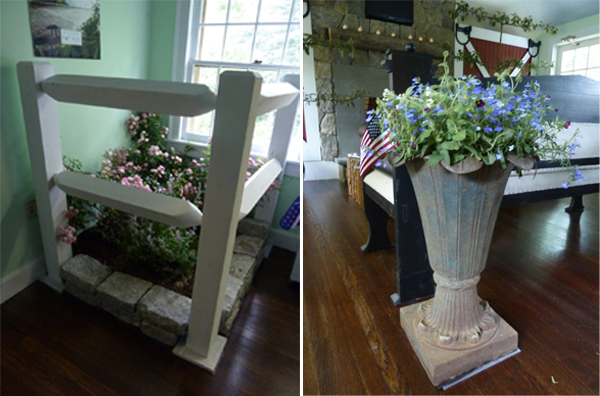 Their Flower Bed Room showed a small portion of what their versatile workroom can create. From fabric wall upholstery, bedding, pillows to complete drapery and furniture upholstery, this originally Dutch company has done it all, including the upholstery and draperies for the private residence of Queen Beatrix of the Netherlands. 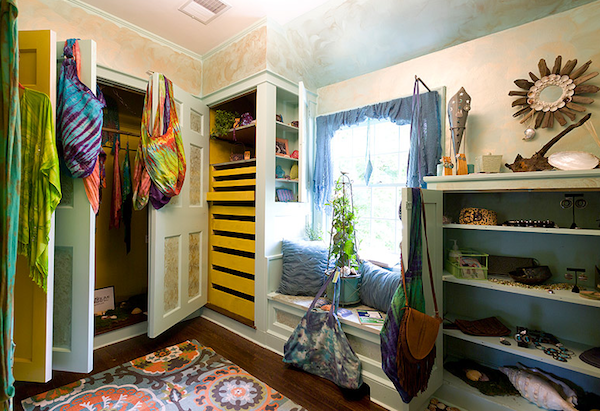 Designer Kathi Gernat‘s tranquil “Meditation Retreat” was a wonderful concept for such a tiny space. 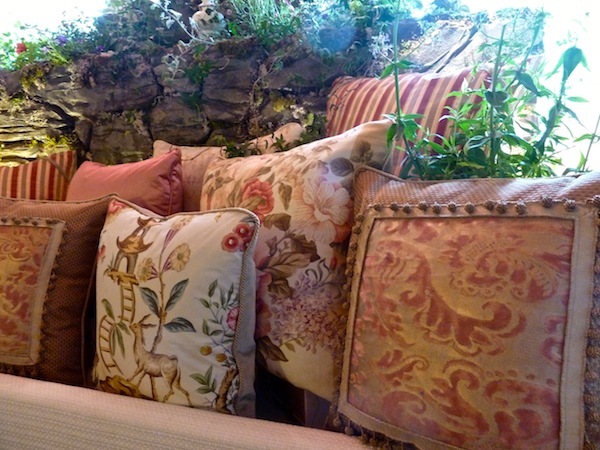 While a departure from her usual projects, it was a welcome solution for a peaceful private sanctuary. 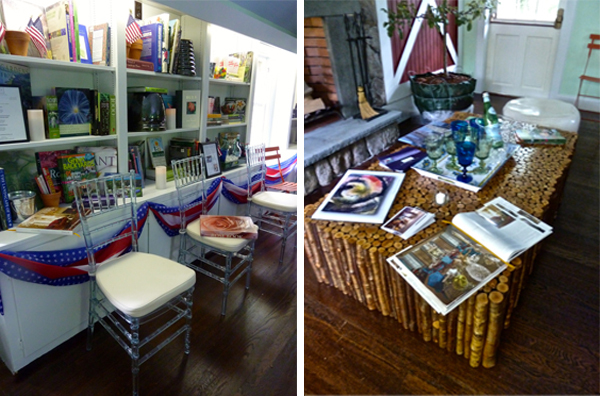 With all the interest in exoticism in decor lately, this worldly space felt very timely. 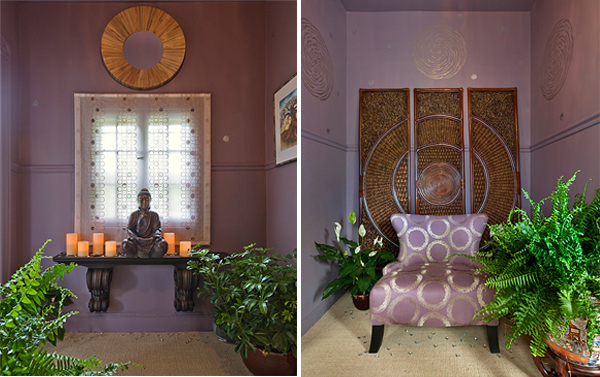 The color purple is a symbol of spirituality and the circle pattern seen throughout the room represents the Mandala, the sacred circle. Gernat offered, “A Meditation Retreat is a gift you can give yourself. Taking time for self renewal is the spark of life that enriches each day.” Such a lovely thought to remember if there is ever a spare nook or cranny to take over as one’s own. I loved how Lyon connected the dots thematically with her two paintings above and the expressive butterfly wall installation. 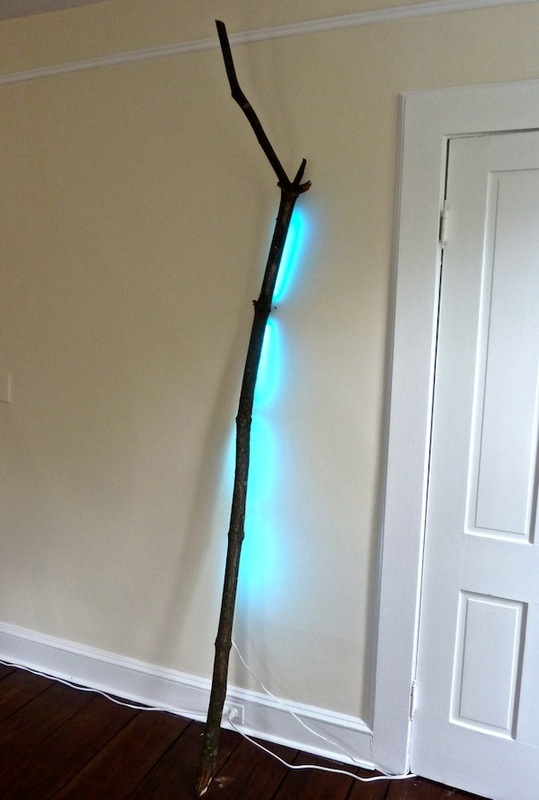 She also brought the garden in with her silver log stool above, the custom live-edged wood table below the beautiful Ichter painting and the inventive tree branch LED light sculpture below. And of course you can imagine how much I adored the fresh blue and orange color scheme!! 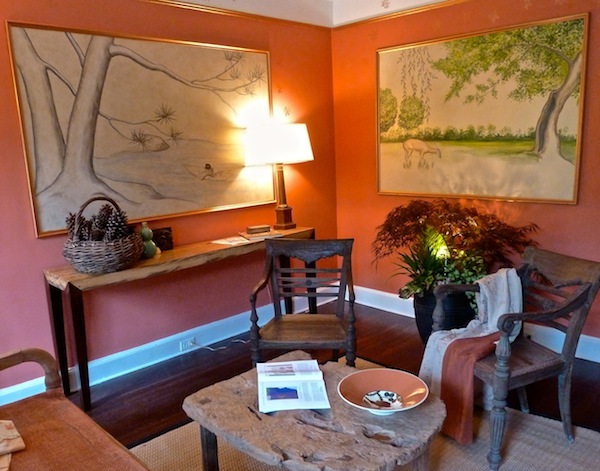 Gay Weathered, of Hand Painted Home, created a room to celebrate trees. Appropriately, this space will become the office of the Director of the Bartlett Arboretum. Against a sophisticated shade from Benjamin Moore’s new Color Stories, the large paintings echo the natural landscape outside. Regina and Michael Kirshbaum’s stylish Agabhumi emporiums are filled with merchandise that the couple create and source on their bi-annual trips to Bali. “Inspired by the edifying design of the Bartlett landscape, we’ve crafted a closet filled with Agabhumi accessories designed to be worn in multiple ways. 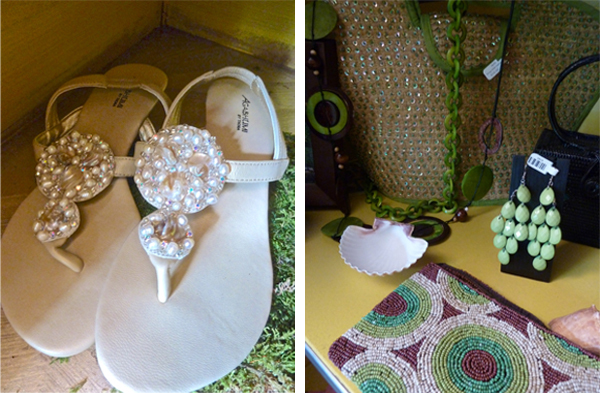 Utilitarian design is an Agabhumi hallmark. 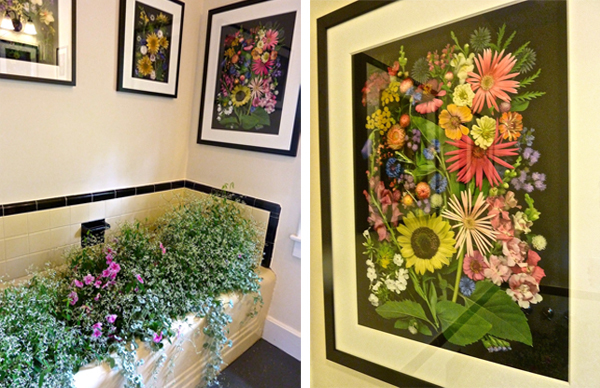 In the tiny upstairs bathroom, above a tub overflowing with seasonal plantings, hung Ellen Hoverkamp’s arresting photographs. My shots do not even remotely do them justice. Using a large format, flatbed scanner as her camera, Hoverkamp creates these exquisite botanical photographs from arrangements of garden-fresh floral, foliage and vegetable samples. I encourage you to visit her website to see more of her beautiful work and Natural Companions, her collaboration with garden author Ken Druse. Brian Cossari, Landscape Architect at Hoffman noted, “Every landscape starts with a vision. Our room at the Bartlett will give homeowners some great ideas of ways they can enhance and use their backyards this summer.” A charming rustic chic interior, the updated library featured landscaping ideas from espaliered trees to container ideas to potted beds – literally bringing the garden in. I hope you’ve enjoyed this week at the arboretum. 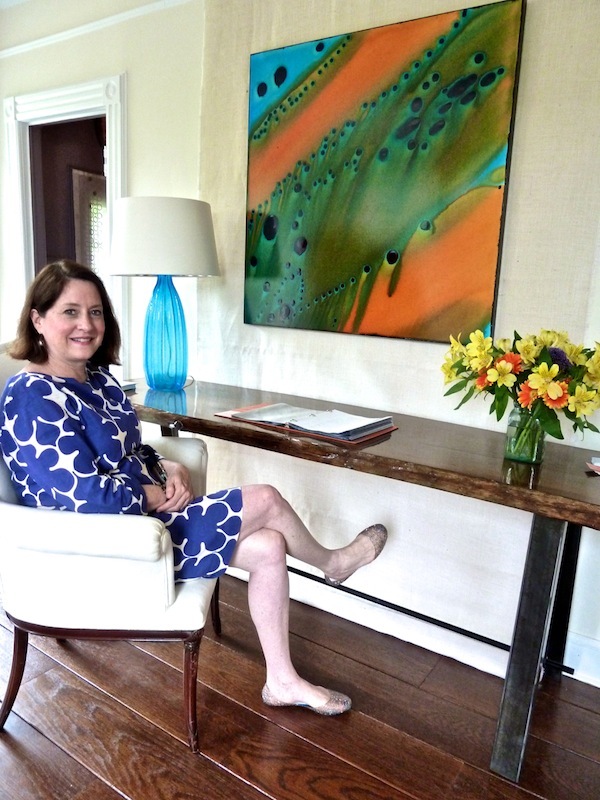 A wonderful local resource, I was delighted to bring a little attention to the wonderful work they do as well as all the designers who contributed their time and talent making this show house a success. A final nod to Nordic Construction for all their wonderful renovation work and to Reclamation Lumber who generously donated the historical wood planks used to restore all the flooring. This entry posted in art, design, fashion, furniture, garden, gifts, interior design. 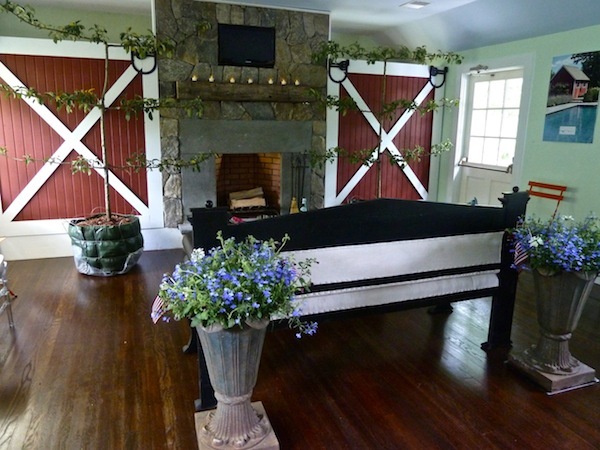 Entry Tags: Finished in Fabric, Gay Weathered, Hoffman Landscapes, interior design, Kathi Gernat Interior Design, Troy Fine Art, Vandamm Interiors, Victoria Lyon Interiors Bookmark the permalink. 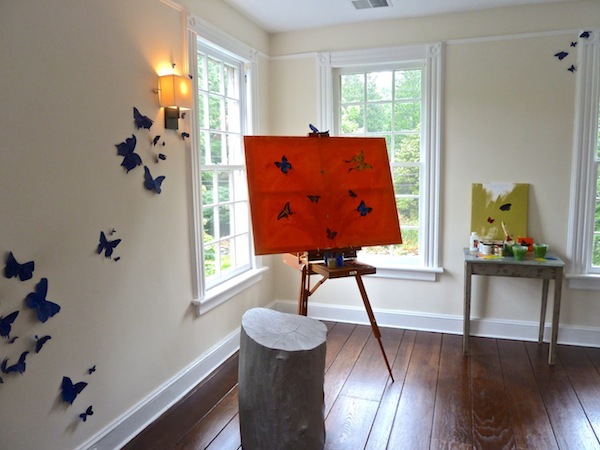 So great, adore that butterfly room/installation, perfect for the arboretum! The flowers in the bathtub and the Hoverkamp prints are very nice touches I think. I’ve so enjoyed a week with you at the arboretum, Stacey. Those Hovercamp photos are amazing – I’m going to peak in at her site for a closer look. This is a wonderful post. Those first two photos are amazing! Love the Dutch influence, stunning fabric and colors. Beautiful! 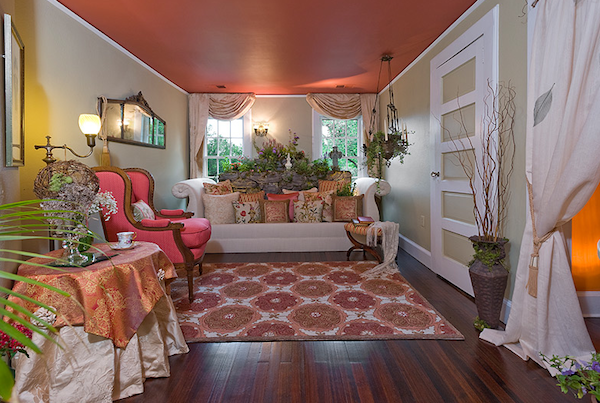 Love the color of the top room. Have a lovely weekend. 78 queries in 0.487 seconds.